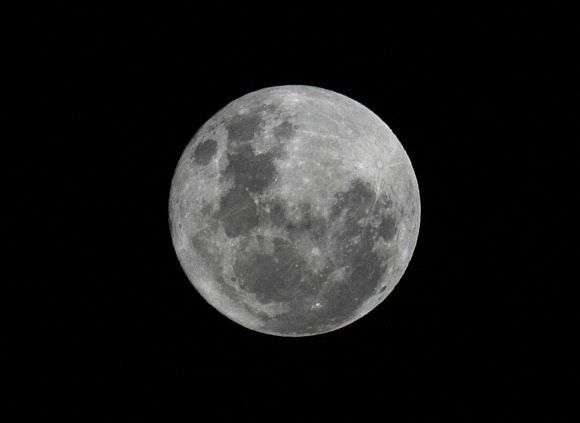 Rediff.com » News » PHOTOS: Watch SUPERMOON this Sunday! 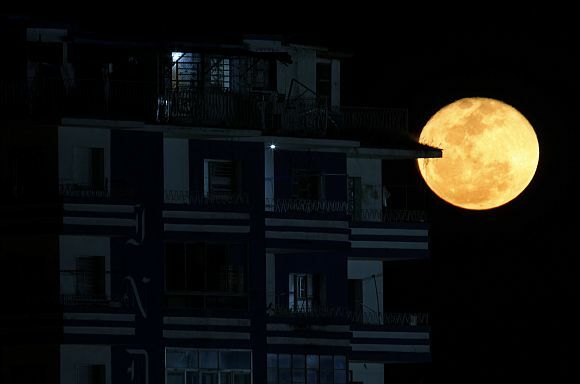 PHOTOS: Watch SUPERMOON this Sunday! The moon will be closest to the earth on Sunday than it will be on any other night in 2012 and will appear significantly larger. The phenomenon, called supermoon, this year coincides with `Buddha Purnima'. On May 6 at 9.05 pm, the distance between the earth and the moon will be 3,56,955 km, the closest this year, and the angular size of the moon will be 0.5515 degrees. It is very interesting to note that on May 6, the moon will set at western horizon a few minutes before sunrise and then it will rise again on the same evening about an hour after the sunset, Arvind Paranjpye, director of Mumbai-based Nehru Planetarium, said. On November 28, the moon will be the farthest from the earth this year and the distance between the two will be 4,06,349 km. Thus, the full moon of May 6 will be about 11 per cent bigger than the full moon of November 28. LOOK: Samsung Galaxy S III: The android becomes human!